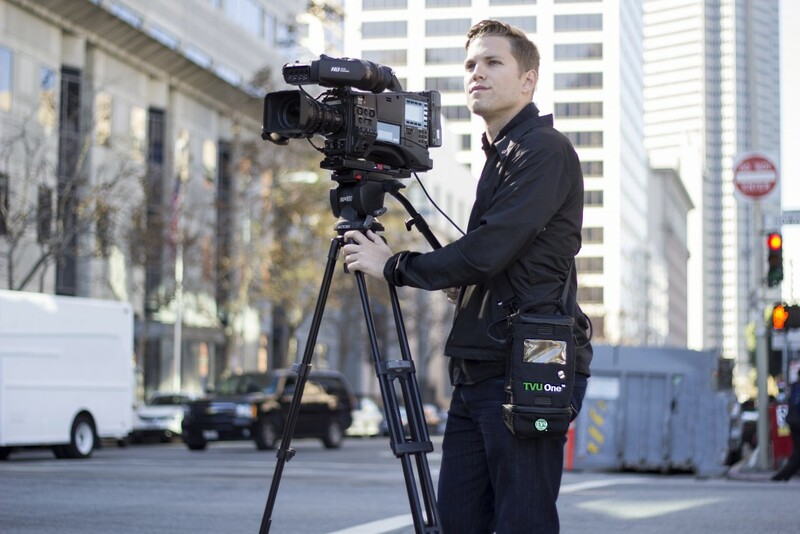 TVU One represents a tremendous leap forward in professional live video streaming solutions. TVU One delivers high-definition picture quality with 0.5 second latency at 3Mbps within an ultra compact and rugged hardware design. It uses HEVC or H.265 compression standard to deliver greater efficiency in data use as well as increased transmission stability. With TVU One, broadcasters of live video can fully leverage the versatility of a small, lightweight, IP-based high-definition video field transmitter without sacrificing performance, features or picture quality. Smaller and Lighter – Made of hardened anodized aluminum and weighing just 2.2 pounds/1 kilogram, the TVU One TM1000 transmitter is compact and easy to handle (7.48″/19cm high x 4.72″ /12cm wide x 2.76″/7cm deep). TVU One is an all-in-one solution that features a rechargeable internal battery, options for multiple embedded cellular modems and external USB modems. It also comes with a carrying case for easy mobility. Touch Screen Controls – TVU One features simple, easy-to-use 3.5 inch LCD touchscreen controls that provide video preview, system status and fine grained control over each transmission. You can also control TVU One wirelessly using your mobile phone or from a studio location with a TVU Receiver or Transceiver video decoder. Learn more about our TVU Receiver or Transceiver here. Internal Battery and Low Power Consumption – TVU One comes standard with an internal rechargeable battery that delivers 120 minutes of use. TVU One is also compatible with gold mount and v-mount batteries when longer live video streaming is required. TVU One also delivers ultra-low power consumption. Plug and Play Compatibility with Multiple IP Connections – TVU One is available in different configurations to fit with your specific live video streaming needs. It transmits simultaneously over multiple aggregated connections, including cellular 3G/4G/LTE (up to six embedded cellular modems and up to four external USB modems), Microwave, MIMO Microwave Mesh, Ka-band and Ku-band satellite, BGAN, WiFi, WiMAX and Ethernet. Connections can be added or dropped without interrupting the live transmission. Supports HEVC/H.265 Compression Standard – TVU One uses the newer H.265 video compression for improved data management with less overhead and data use. Combined with TVU’s proprietary Inverse StatMux Plus technology, TVU One provides increased efficiency with latency as low as 0.5 seconds even when transmitting in a moving vehicle. Simple Worry-Free Operation – TVU pioneered one button operation in portable live video streaming transmitters, and TVU One carries on that tradition. TVU One requires no in-field configuration, and boots up in less than 20 seconds with just the push of a button. Small Form Factor, Big Features – Despite its small size, TVU One is feature-rich with no compromises to performance or capabilities. To see a full list of hardware and software specifications for TVU One, view them here. Inverse StatMux Plus – TVU One features proprietary video transmission technology called Inverse StatMux Plus (IS+). With IS+, unsurpassed HD picture quality is dependably delivered at sub-second latency over cellular 3G/4G/LTE modems even when transmitting in a moving vehicle traveling at over 60mph/100kph. Powerful Real-Time Store and Forward – TVU One can simultaneously live stream and record. TVU One can record up to 7 hours of full HD footage, depending upon the selected configuration. Additionally, TVU has HD file transfer functionality that ensures the delivery of a HD quality error-free video clip to the studio in real-time without needing to wait until the clip is fully recorded on the transmitter. Fully Compatible with TVU Grid – TVU’s IP based video switching, routing and distribution solution allows a broadcaster to share a TVU One live video transmission with any other TVU Grid enabled station, operations center or physical location. TVU Grid features very low latency when switching, routing or distributing live video. TVU One also works with the full slate of TVU’s Cloud-based video content management solutions, including TVU Command Center, TVU Alert and TVU Booking Service. The TVU One 4K model will be shown at NAB 2019. Read the press release here. You can also use TVU One to reach viewers on social media. TVU One is integrated with Facebook Live allowing you to transmit live video directly using the Facebook platform. In addition, set up and operation of TVU One with Facebook Live is simple and fast. Learn more about using TVU for Facebook Live here. Sky News Arabia needed a solution that was easy to use in the field. Read about it here here. Marquette University shares campus footage with media outlets by deploying a TVU portable cellular transmitter. Read about it here. KPTM news station streamlined its production costs while still being able to deliver breaking news with TVU. Read their complete story here.